If anyone was on the fence about whether or not a subscription to DC Universe’s streaming service was worth it, Doom Patrol just might be the tipping point. The series follows a group of misfit not-quite-heroes, some of whom we met in a very special episode of Titans, as they struggle to understand themselves under the tutelage of their mysterious benefactor, Dr. Niles Caulder (Timothy Dalton). You know they have faith in the material when they cover up that face. The pilot episode, written with gusto by Jeremy Carver and directed by the skilful Glen Winter, opened with an entirely different character however. In fact, the entire series appears to be told from the POV of the so-called Mr. Nobody (Alan Tudyk, putting in a stellar vocal performance), a from the 1940s who experimented on himself with the help of an ex-Nazi and also coincidentally holds a grudge against Niles for reasons yet to be determined. While he claims not to be an unreliable narrator, his bitterness makes for a unique and humorous version of “super zero” events. And at first, the members of the Doom Patrol do seem like a bunch of zeroes, as we’re thrust into the middle of Cliff Steele’s (Brendan Fraser, who plays both both lewdness and loss with equal fervor) affair with the nanny while his wife works out and his child cries in the next room. Their marriage quickly came to a fiery end, only for what was left of Cliff to end up at Dr. Caulder’s home ten years later inside of a metal encasing that comic book readers know as Robotman. Caulder – who goes by Chief – may be the most disconcerting thing about the pilot episode, if only because he was played by Bruno Bichir is his first appearance and came off much colder and more frightening that he does now. It’s not a bad change, though, as I much prefer the kindly if misguided version Dalton embodies to the steely one that filled Gar with fear. Speaking of Gar, that’s the second point of contention: it’s unclear when in the timeline he lived with the group, seeing as they don’t mention him once despite reaching present day by the end of the premiere. She’s totally worth the wait. Those are really the only two issues in the entire beautifully constructed hour, because the rest of Doom Patrol is devoted to introducing most of its protagonists and exploring their tragic tales. Rita Farr (April Bowlby, equal parts flighty and full of heart) watches her films on a loop and remembers the days before she was a pile of goo known as Elastigirl, while Larry Trainor (Matt Bomer, in an understated performance that makes use entirely of his rich and emotive voice) makes light of his losses and the life he was hiding back in the 60s. The disconnect between what these characters say about themselves, what they learn from third parties, and what is revealed to the audience by Mr. Nobody’s omniscient narration comprises half of the show’s charm. The rest comes from stunning cinematographic sequences that underline just how much effort DC has put into this show. The final member of the Doom Patrol to be introduced, in the first week at least, is also the hardest to categorize. 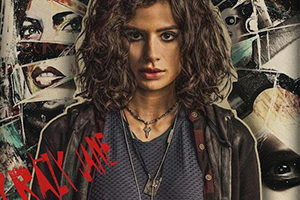 Crazy Jane (Diane Guerrero, in a tour de force performance that showcases a lot more range than her previous works) appears halfway through the premiere, in the year 2019, alongside her 63 other personalities and the different powers they possess. Despite the abrasiveness of her introduction, Cliff seeks her out and offers his hand in friendship and understanding. It’s a fragile bond, but one that encapsulates the beauty of the show’s themes and reminds viewers that everyone is deserving of love. Of course, it’s not all sunshine and rainbows, seeing as there’s even more darkness lurking in their past that they are unaware of – and in Chief’s past too. After a harmless trip into town turns into a very harmful one indeed, all Hell breaks loose and begins to pave the way for the rest of the season. Jovian Wade as Cyborg is the show’s final revelation thus far, and one of its best, but we’ll talk about him next week. 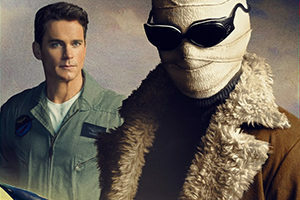 Make sure to check out Doom Patrol‘s first episode Friday on the DC Universe streaming service.